Rhodes Holidays Free Child Places 2019 @Web2traveldeals. Online Since 2000. Finding the Best Value Holidays with Free Child Places Rhodes from U.K. airports. Popular resorts include Faliraki, Kolymbia, Kiotari, Lindos, Pefkos. Looking for Free Child Places Rhodes 2019? Stop wasting time phoning round all the Tour Operators and going into high street branches. Our Team at @Web2travelDeals have been very busy doing all the legwork for you to find out which Rhodes resorts have holidays from the UK to Rhodes with Free Child Places School Holidays. You can search and compare deals from all the Top Tour Operators such as First Choice, Tui, Thomas Cook, Airtours, Jet2Holidays. Once you have found the perfect place for your getaway, you can book your family holiday online direct with the Company using one of our quick links. Rhodes Holidays Free Child Places 2019. Family Life Aegean Blue by Atlantica, Sun Palace Hotel, Holiday Village Rhodes, Matina are all places where we have found Free Child places for Summer 2019. Other hotels and apartments shown below have offered Free Places in past years. This post is designed to save you time and money when searching for Rhodes Holidays Free Child Places 2019. This post Free Child Places Rhodes 2019 shows you hotels and apartments which our team have visited to check that free child places may be available. View some examples below. Get More Information, and claim your Free Child Place TUI FAMILY LIFE Atlantica Aegean Blue, KOLYMBIA, Rhodes. Get More Information, and claim your Free Child Place Hotel Sun Palace, FALIRAKI, RHODES. Get More Information, and claim your Free Child Place Holiday Village Atlantica Rhodes, KOLYMBIA, RHODES. Deals below relate to previous years -Still to be updated for 2019. Atlantica Aegean Blue, Kolymbia, Rhodes, 5 star, 7 nts All Inclusive From £3066 (total family of 4 with FREE CHILD PLACE) inc East Midlands flights Dep July 2018. Non-stop activities, loads of pools and an adventure splash park. Other examples shown below do not have Free places available but do offer some great deals on family holidays in the summer. Kiotari Seaside, Kiotari, Rhodes, 3 star plus, All Inclusive from £2008 (total price for family of 4 in July). Princess Andriana Resort & Spa, Kiotari, Rhodes, 5 star plus, All Inclusive from £3099 (total price for family of 4 in July). Lindos Imperial Hotel, Kiotari, Rhodes, 4 star, 7nts All Inclusive from £2886 inc flights from NCL (total price for family of 4 in July). Pefki Islands Resort Pefkos, Rhodes, 3 star plus, 2 bedroom Apartment, Self Catering from £1543 (total price for family of 4). 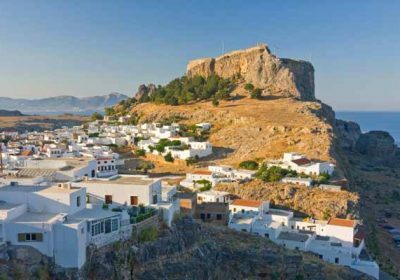 Lindos View Studios, Lindos, Rhodes, 3 star plus, 1 bedroom apartment, Self Catering from £1466 (total price for family of 4) half Board Option. Lindos Gardens. Lindos, Rhodes, 3 star, 1 bedroom apartment, Self Catering from £1346 (total price for family of 4). Lambis Studios, Lindos, Rhodes, 3 star, Self Catering from £1293 (total price for family of 4). Atlantica Princess Hotel, Trianda, Rhodes, 5 star, family Room, Half Board from £1789 (total price for family of 4) All Inclusive Option. Lindia Thalassa Studios and Apartments, Pefkos, Rhodes, 3 star plus, 2 bedroom Apartment, Self Catering from £1484 (total price for family of 4). Pefkos Beach Pefkos, Rhodes, 3 star plus, Apartment, Self Catering from £1323 (total price for family of 4). Pefkos Garden Hotel. Pefkos, Rhodes – 7 nts All Inclusive inc flights from Stansted Dep July. The above prices were taken from Tour Operators websites in 2016 based on departure dates in early Summer 2017 and include 1 free child place. Prices are shown as a guide and are likely to be the lowest available within holiday period, often in early May. Prices will vary dependent on departure date and can often be considerably higher during peak holiday periods such as Summer School Holidays. View more destinations for Holidays Free Child Places departing from the UK at Web2travel.co.uk.